Zuri brings to you an album of top 17 and really gorgeous Arabic mehndi designs! So, this summer, look sassy as you flaunt henna clad hands and feet in style! Feeling artistic? Looking to decorate your hands for an upcoming wedding or for a special occasion? Then you have all the reasons to be happy! Zuri has compiled an album of 17 gorgeous Arabic mehndi designs for your hands and feet. Why Arabic? Because, these designs are in vogue and look stylish. Besides, the best thing about this mehndi style is that it suits all age groups and goes well with all sorts of dressing. Whether you are wearing a western dress (an evening gown) and attending a cocktail party or a Pakistani suit and stepping out for a friend’s baby shower, or perhaps in your Anarkali suit/lehenga or designer saree, attending a wedding in your family, Arabic mehndi design looks sassy in any which case. The charming and mesmerizing patterns of Arabic mehndi designs have become popular in India and abroad. Besides, one can embellish the pattern with sequins, glitters and colourful sparkles. At some places, the wedding functions are incomplete without the simple yet elegant Arabic mehndi designs. 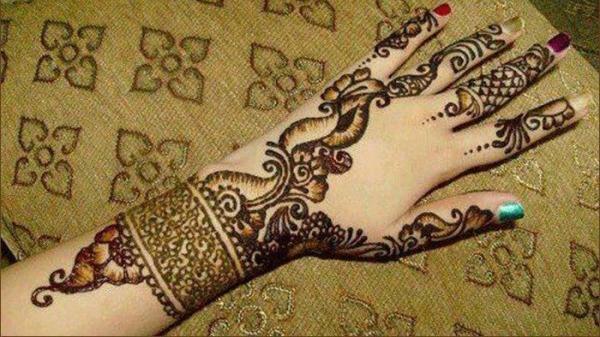 Moreover, bride and relatives love to flaunt henna clad hands and legs on the pre-bridal functions. If you are a lover of floral patterns, paisleys, moon, star, sun and all, then this is an ideal mehndi style for you. I have discusses this before too but would like to reiterate that unlike Indian mehndi designs (particularly- Rajasthani or Marwari style of mehndi), the Arabic-style design is far too less-complicated. But, it is a lot of hard work for a mehndi artist! This is for the simple reason that this style form requires much detail and involves miniature patterns which are simple to look at but need a lot of focus at the time of application. What makes Arabic mehndi design appeal to all is the versatility it brings with it (in terms of colour and construction). That’s why I prefer Arabic mehndi! It is much sought after, goes well with all types of occasions (or no occasions). So, what are you waiting for? Try out any of these stunning mehndi designs now and look ultra-stylish for an upcoming event.